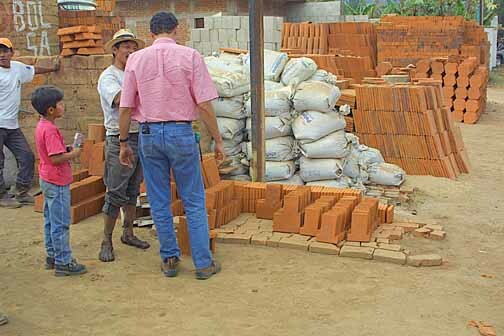 This is a photo of baldosas made by a brick maker in Guatemala for HELPS International. In the foreground you see the formed Rocket elbow parts which create the combustion chambers in griddle stoves in the same way they would serve in a modified Lorena. Don O'Neal is an expert in the use of baldosa in Rocket stoves. I'm sure he would like to help if you have any technical questions. 1. In front of Richard (blue jeans) are molded part to make a combustion chamber. 2. The guy with muddy feet is the maker and he mixes the clay by stomping in it. 3. 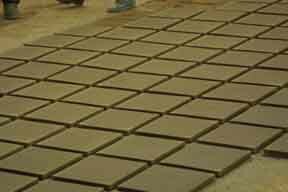 In the back ground are the standard baldosa for floor tile use. 5. Behind the guy with the muddy feet and Richards left leg can be seen the metal frames for molding the parts. 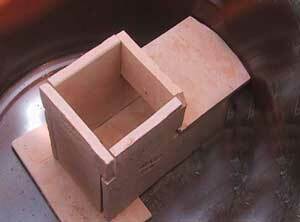 Assembled combustion chamber, Red after baking Floor tile baldosa before baking, Brown in color.